It may be all to easy to not take an internship seriously, especially if you're not getting paid for it. But an internship is still a job that serves as an important career move. The connections you make at an internship are invaluable which is the trade-off for not being monetarily compensated. Plus, an exceptional performance can often lead to a paid offer from the organization. These opportunities aren't handed out to everyone so those that do get them should not miss out on the many advantages that come with them. There are plenty of ways to mess up an internship that can have consequences on your professional careers. Here's how to avoid sabotaging yourself in the long-run. 1) Complaining or showing disdain towards menial assignments. Part of being an intern is paying your dues. You can't expect to move up if you can't manage to handle the little things with a smile. Once you've proven you're capable of giving 100% to every task, no matter how boring, people will want to see what you can do when you're challenged. 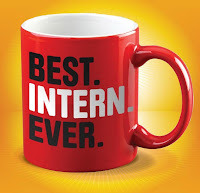 Enjoy your time as an intern since there are plenty of others who would jump at the chance to take your spot. 2) Not dressing the part. Dressing inappropriately can often say more about your standard of professionalism than your performance. It's a clear relection of how seriously you take your job so you want to be able to show that you understand their expectations. Try to mirror the level of formality that your supervisors and collegues wear to play on the safe side. You can always add your own style as long as they stay along the same lines. Avoid flip flops, showing too much skin, or visible undergarments. 3) Being more casual than you should. Even informal workplaces tend to be more formal than a campus atmosphere, and interns need to adapt. Anything that has to do with a career setting must uphold a standard of professionalism. That line needs to be clearly established and not crossed. That means don't put your feet up on your desk, use text-speak in emails, swear, or use cavalier phrases like "my bad" when you realize you made a mistake. 4) Not fitting in with the office culture. Part of making a good impression has to do with how well you get along with the people in the office and their way of operations. Office culture is a very important factor in determining how you do things around the office. It's pretty simple to observe how others in the office go about doing things and adapt. Since you're new you should be learning and picking up onthings as much as possible. Keep in mind that you're working around professionals so you'll want to follow their lead. While you want to make a stand-out impression on your higher-ups, you don't want to make it a competition with your fellow interns. At this point, you guys are a team. And with that, you also don't want to simply stick to them either. Getting to know as many people around the place will get you noticed and leave an impression, which is what you want when making career connections. 6) Not asking for or taking heed of feedback. Internships are a learning experience and with every lesson comes constructive criticism. Your co-workers and supervisors are there to support you and offer their insight. Their main goal is to help train and prepare you for a future in the industry but they can't do so unless you meet them halfway. Most employers will offer feedback without you asking, but it makes a bolder statement when you solicit it yourself. It shows them that you have an active interest in your performance. 7) Not being involved enough. Being involved at your internship goes beyond your expected duties. Do things that aren't required of you or find ways to be a part of a project that may not have initially involved you. Going above and beyond will make it clear that you are invested in your place there and that you're enthusiastic about your work. This is the kind of attitude that will take you places. 8) Forgetting to thank people. This may sound silly but it can be easy to forget simple manners when you feel comfortable around people. It's a good thing to feel at ease at your internship but it shouldn't change the tone of your interactions with people. Those who help you need to see that you appreciate it since they aren't obligated to do so. Let people know that you're grateful for any help extended to you. 9) Making it about you. Listen more, talk less. That should be one of your general rules at any internship or workplace. It can be easy to fall into the idea that you need to say more in order for people to take you seriously. However, if people get the impression that you want your own ideas to dominate then they will merely considered you self-centered. Be a sponge instead and soak up as much information from others as you can. 10) Losing touch when your internship ends. Keeping in touch after you leave your internship is extremely important since it's up to you to make the most of the connections you made. Interns come and go at companies so in order to still be able to take advantage of any future opportunities, you'll have to make the effort to keep your presence alive in their minds. Maintain and build on relationships with people who can help you down the road and eventually you'll find yourself among that circle of people rather than outside of it.